A rebel commander and witnesses told reporters a Nato warplane had carried out Wednesday's bombing. Nato said it had carried out a strike but could not confirm rebel vehicles were hit. Later, government troops were reported to have re-taken Kufra in the south and a crossing on the Tunisian border. Misrata has been the scene of intense fighting because of its strategically crucial port. A Nato official confirmed alliance aircraft had struck "a number of combat vehicles 10 miles south-east of Misrata port", in an area where a large group of pro-Gaddafi fighters had been broken up on Tuesday. The official said Nato could not "independently verify reports that these vehicles were operated by opposition forces" but said there had been no Nato attack on any building in or around Misrata. Later on Thursday, there were reports of violent clashes in the southern city of Kufra. 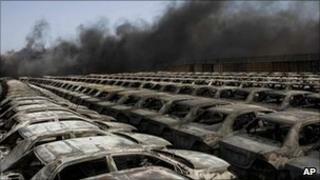 One rebel told AFP that 60 cars carrying some 250 pro-Gaddafi fighters had arrived in the town and retaken it. He said the rebels had put up "light resistance" but that there were no casualties. Another fighter said the government troops had attacked a courthouse, from which they then flew the green Libyan flag. The rebels' National Transitional Council said told AFP were sending reinforcements to Kufra. In recent days fighting over Misrata port has intensified and rebels say on Tuesday pro-Gaddafi forces fired Russian-made Grad rockets, which rights groups say should not be used in civilian areas.